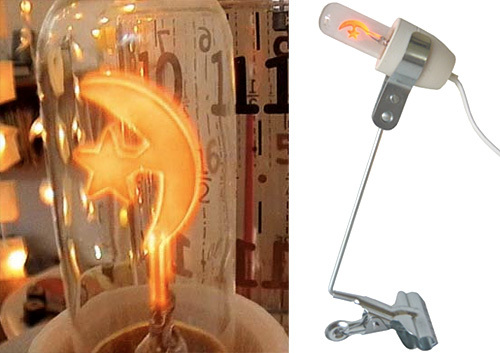 Clip-On Nightlight With Moon And Star Shaped Filament Bulb | OhGizmo! By Andrew Liszewski on 03/04/11 • Leave a comment! While it’s technically considered to be a clip-on lamp, I don’t think the Veilleuse d`Orient from Tsé & Tsé Associées is going to throw enough light to be useful for anything other than chasing the boogeyman away. And the whimsical moon and star-shaped filament removes any doubt this is destined to be used as a versatile night light in children’s bedrooms around the world. ~$75 (€54.50) from Wannekes, including a spare bulb.